This book investigates how British diplomats in Tehran and London reacted to the overthrow of the Shah and the creation of an Islamic Republic in Iran, which had previously been a major political and commercial partner for London in the Middle East. Making substantial use of recently declassified archival material, the book explores the role of a significant diplomatic institution ? the resident embassy ? and the impact of revolutions on diplomatic relations. 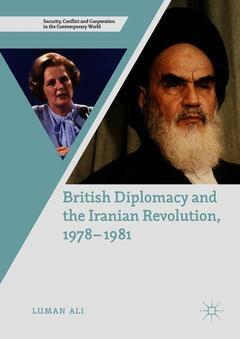 It evaluates the performance of those charged with British diplomacy during the Iranian Revolution, as Britain?s position fell from favour under the post-revolutionary regime. Examining the views of key diplomatic personnel at the Foreign and Commonwealth Office and British ministers, this study seeks to explain how British policy towards Iran was shaped and the means of diplomacy employed. In charting the evolution of Britain?s diplomatic relationship with Iran during this period, a number of factors are considered, including historical experience, geography, economics, world politics and domestic concerns. It also highlights the impact of events within the Iranian domestic political scene which were beyond London?s control but which shaped British policy significantly. Chapter 1 - Introduction.- Chapter 2 - Britain’s relationship with Iran before the 1970s.- Chapter 3 - The British mission in Iran in the 1970s.- Chapter 4 - Iran’s descent into Chaos.- Chapter 5 - The embassy’s failure to predict the Iranian revolution.- Chapter 6 - A new ambassador and the question of recognition.- Chapter 7 - Adjusting to a revolutionary state.- Chapter 8 - Britain and the fallout of the US embassy hostage crisis.- Chapter 9 - From the Iranian embassy siege to becoming an interests section.- Chapter 10 - No early return for the British embassy: the interests section and the revolution, 1980-81.- Chapter 11 - Conclusion. Luman Ali completed his PhD in History at the University of Nottingham, UK, in 2016.